For similar but smaller tools used typically in pairs for ice climbing, see Ice tool. An ice axe is a multi-purpose hiking and climbing tool used by mountaineers both in the ascent and descent of routes that involve frozen conditions with snow and/or ice. An ice axe can be held and employed in a number of different ways, depending on the terrain encountered. In its simplest role, the ice axe is used like a walking stick in the uphill hand, the mountaineer holding the head in the center. It can also be buried pick down, the rope tied around the shaft to form a secure anchor on which to bring up a second climber, or buried vertically to form a stomp belay. The adze is used to cut footsteps (sometimes known as pigeon holes if used straight on), as well as scoop/bucket seats in the hillside and trenches to bury an ice axe belay. The long-handled alpenstock was a predecessor to the modern ice axe. An ice axe is not only used as an aid to climbing, but also as a means of self-arrest in the event of a downhill slip. Most ice axes meet design and manufacturing standards of organizations such as the Union Internationale des Associations d'Alpinisme (UIAA) or European Committee for Standardization. There are two classifications of ice axe, Basic (B/Type 1) and Technical (T/Type 2). Basic ice axes are designed for use in snow conditions for general mountaineering, and are adequate for basic support and self-arrest. Technical ice axes, which may have curved shafts, are strong enough to be used for steep or vertical ice climbing and belaying on such ground. Specialized ice axes used for vertical ice climbing are known as ice tools. Ice tools have shorter and more curved shafts; stronger, sharper, and more curved picks which can usually be replaced, and often ergonomic grips and finger rests. Used in a pair one is usually equipped with an adze whilst the other has a hammer to aid gear placement. For ski mountaineering and racing, where weight is of paramount concern, manufacturers have produced short (~45 cm [18 in]) and light (200–300 g [7–11 oz]) ice axes. Some of these have aluminum alloy heads/picks which are unlikely to be as effective or robust as steel heads/picks. Head – usually made of steel and featuring a pick and adze. A hole in the center is provided for attaching a wrist leash or carabiner. Pick — the toothed pointed end of the head, typically slightly curved (aiding both in ergonomics and self-arrest). Adze — the flat, wide end of the head used for chopping steps in hard snow and ice. Hammer — the hammer is an alternative to the adze. May be used for aiding placement of protection. Shaft — straight or slightly angled, typically wider front-to-back than side-to-side, flat on the sides and smoothly rounded on the ends. Traditional shafts were made of wood, but are now almost exclusively of lightweight metals (such as aluminum, titanium and steel alloys) or composites (including fiberglass, Kevlar or carbon filament). Spike, or ferrule — a, usually steel, point at the base of the shaft used for balance and safety when the axe is held by its head in walking stick fashion. A leather pick & adze guard installed on an ice axe. Leash – nylon webbing with an adjustable loop for securing the axe to hand. Often secured by a ring constrained to slide a limited distance on the shaft. Leash stop – a rubber keeper or metal stud preventing the leash from slipping off of the ice axe. Snow basket – similar to baskets on ski poles, temporarily mounted on the shaft close to the spike to keep the shaft from sinking into soft snow. Not at all common in Europe. Pick and adze guard – a cover to protect from sharp edges and points when the axe is not being used. Spike guard – a cover to protect from the sharp spike when the axe is not being used. Ice-axe spike-to-head lengths used to generally range from 60–90 cm (24–35 in). This is just too short to be used as a walking stick on level ground (the way its forebearer, the 1.5-metre-long [5 ft] 19th century alpenstock, was), but is ergonomic when ascending steep slopes. For flatter ground, where consequences of a slip are not large, walking poles are more appropriate. The old method to approximate the correct length of an ice axe was for the climber to hold the axe (spike facing the ground) at his/her side while standing relaxed. The spike of the ice axe should barely touch the ground when the climber stands fully upright holding the axe in this manner. This may still be appropriate where the ice axe is to be used for travelling over relatively flat ground, perhaps, in the main, for glacier travel. The antecedent of the ice axe was the alpenstock, a long wooden pole with an iron spike tip, used by shepherds for travel on snowfields and glaciers in the Alps since the Middle Ages. On 8 August 1786, Jacques Balmat and Michel-Gabriel Paccard made the first ascent of Mont Blanc. Balmat, a chamois hunter and crystal collector, had experience with high mountain travel, and Paccard had made previous attempts to climb the peak. Illustrations show Balmat carrying two separate tools that would later be merged into the ice axe – an alpenstock (or baton) and a small axe that could be used to chop steps on icy slopes. According to the earliest manufacturer of ice axes, Grivel, these two tools were merged to create the first true ice axe around 1840. Early ice axes had a vertical adze, with the cutting edge aligned with the direction of the shaft, as in a conventional axe. This design lasted until at least 1860, but eventually the adze was rotated to the current position, perpendicular to the direction of the shaft. The Italian Alpine Club published a book in 1889 entitled Fiorio e Ratti – The dangers of mountaineering and rules to avoid them, which recommended ice axes as among "the inseparable companions of the mountaineer". In the late 19th century, the typical ice axe shaft measured 120–130 cm (47–51 in) in length. British climber Oscar Eckenstein started the trend toward shorter ice axes with a lighter model measuring 85–86 cm (33–34 in). Initially, this innovation was criticized by well-known climbers of the era, including Martin Conway, a prominent member of the Alpine Club, who was the leader of an early expedition to the Baltoro region near K2 in 1892 of which Eckenstein was a member. Early ice axes had picks and adzes of about equal lengths. By the beginning of the 20th century, the pick lengthened to about twice the length of the adze. Improvements in crampon design (pioneered by Eckenstein in 1908) and ice climbing technique led to use of shorter, lighter ice axes appropriate to steeper ice climbs in the period between the world wars. A famous rescue involving an ice axe took place during the Third American Karakoram Expedition to K2 in 1953. One of the climbers, Art Gilkey, was incapacitated by thrombophlebitis. The other climbers attempted to rescue him by lowering him down the mountain by rope, wrapped in a sleeping bag. While crossing a steep ice sheet, a slip caused Gilkey and five other climbers to begin falling down a steep slope. Climber Pete Schoening wedged his ice axe alongside a boulder, and managed to belay the roped climbers, saving their lives. (Gilkey, however, later in the same descent was swept away by an avalanche. Remains of his lost corpse were discovered in 1993.) Schoening's ice axe is now on display at the Bradford Washburn American Mountaineering Museum in Golden, Colorado. In 1966, Yvon Chouinard led a significant redesign of ice axes, working with initially reluctant manufacturer Charlet to develop a 55-centimetre-long (22 in) ice axe with a dramatically curved pick. Chouinard believed that "a curve compatible with the arc of the axe's swing would allow the pick to stay put better in the ice. I had noticed that a standard pick would often pop out when I placed my weight on it." Chouinard's idea worked and began a period of innovation in ice axe design. In 1978, the Safety Commission of the Union Internationale des Associations d'Alpinisme (UIAA) established formal standards for ice axe safety and performance. This led to the replacement of the traditional wooden shaft by metal alloy shafts. Ergonomically curved handles became widespread in 1986. Use of modern aluminum alloys have led to a dramatic reduction in the weight of some ice axes. One model now on the market, the C.A.M.P. Corsa, weighs only 205 g (7.2 oz) with a 50-centimetre-long (20 in) shaft. One expert rated this lightweight ice axe as "ideal for low angle glacier travel" but said he "craved the solid and secure heft of a true steel mountain ax" in more demanding steep alpine conditions. A mountaineering ice axe, often wrongly referred to as an "ice pick", was used in the assassination of Leon Trotsky by Ramón Mercader in Mexico City in 1940. An ice axe was also used in the 2005 murder of Anthony Walker in the United Kingdom. A 2011 Black Diamond ice axe. 71 cm (28 in) long with a weight of 430 g (15 oz). On the frequently long approach to the snowline, or when the terrain does not warrant the use of an axe, it is common for ice axe(s) to be carried on a rucksack. 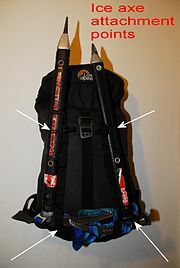 Many rucksack models come with one ice axe loop (on the outside of the rucksack at its foot and generally in the middle), together with a device (a strap or a bungee cord) to attach it to the main body of the sack. Rucksacks with attachment points for two ice axes are also available, and these are popular for use with ice tools. To use these attachment points drop the shaft of the ice axe down through the loop, then bring the end of the axe up (in an arc) to the strap/bungee, thus wrapping the head in the loop. In this way the axe cannot slide down and out of the attachment. Shorter ice axes or ice tools are sometimes slid down through the compression straps on the sides of a rucksack, but this does present some danger to others nearby as the sharp points of the picks are at eye level! For short passages where the hands are needed and/or the ice axe is not required a common and convenient, easily accessible, stowage is to slide the axe down between the back and the rucksack, between the shoulder blades. This is quick and easy to do and to retrieve when needed, but removing the rucksack with the axe in place will lead to dropping the axe as it is only resting in situ, unattached. ^ "Ice Axes: How to Choose". REI. Retrieved 11 February 2014. ^ "Hill skills: your first axe and crampons". www.thebmc.co.uk. Retrieved 10 April 2018. ^ "How to Choose Ice Axes". REI. Retrieved 10 April 2018. ^ "Choosing an ixe axe, crampons and winter boots". www.expeditionguide.com. Retrieved 10 April 2018. ^ a b c "History: The Ice-Axe". Grivel Mont Blanc - Since 1818. Archived from the original on 8 May 2008. Retrieved 29 November 2009. ^ Rowell, Galen (1977). In The Throne Room of the Mountain Gods. San Francisco: Sierra Club Books. pp. 36–40. ISBN 0-87156-184-0. ^ Viesturs, Ed. No Shortcuts to the Top. ^ Rowell, Galen (1977). In The Throne Room of the Mountain Gods. San Francisco: Sierra Club Books. pp. 226–234. ISBN 0-87156-184-0. ^ "Artifacts". Bradford Washburn American Mountaineering Museum. Archived from the original on 27 December 2009. Retrieved 27 November 2009. ^ Chouinard, Yvon (1978). Climbing Ice. San Francisco: Sierra Club Books with American Alpine Club. p. 27. ISBN 0-87156-208-1. ^ Goldie, Larry (25 September 2008). "C.A.M.P. Corsa Ice Axe: Too Light for a Real Challenge". Alpinist 28: The Alpinist Mountain Standards. Retrieved 27 November 2009. ^ "Leon Trotsky murder weapon resurfaces in Mexico". USA Today. 11 July 2005. Retrieved 4 May 2010. ^ "Youth guilty of racist axe murder". BBC News. BBC. 30 November 2005. Retrieved 21 January 2007. Wikimedia Commons has media related to Ice axes. This page was last edited on 1 March 2019, at 21:29 (UTC).